I spent the last week in Paris seeking inspiration for a new project, catching up with some theatre friends and seeing various shows, exhibitions and people. I was staying with Melanie Tanneau who is someone I met whilst doing performance training with Fairground Theatre Company in Bristol around 2007. We did some shows together and have always shared a love for similar creative work. After living in Bristol she returned to France to train at École Jacques Lecoq and after graduating founded Compagnie 38 with the rest of her year. She now works as a performer and deviser in Paris whilst working with the company. My visit coincided with a season of work by experimental American Director Robert Wilson and we went to see The Old Woman at Théâtre de la Ville. The show is Wilson's most recent work and stars Russian dancer Mikhail Baryshnikov and American actor Willem Defoe. Baryshinkov's movement was delightful to watch and Defoe's physicality, voice and clowning were mesmerising but the aggressive and somewhat hollow show left me with a sour taste. Mel, Jess (also of Compagnie 38) and I went to La Nuit de la Marionette at Théâtre Jean Arp in the Banlieue. The evening was part of the Mar.t.o Festival and was the fifth edition of the night. We took a coach from Chatalet at 6pm in the evening, watched 10 hours of live puppetry and took a coach back to Paris at 6am in the morning. Despite the evening being a merry time and a unique theatrical experience, unfortunately many of the shows were disappointing and, coming from the rich puppetry scene in Bristol, I felt like I had seen many of the techniques before but realised in a far more memorable and sophisticated way. Some of the work brought to mind the brilliant UK company The Paper Cinema. Led by the virtuoso illustrator Nic Rawlings and Imogen Charleston with spine-tingling live music by Chris Reed, Paper Cinema are one of the closest things to the oft bandied about term 'live-animation'. Perhaps they are not unique in the use of their technique, in terms of filming live, moving things and projecting them onto a screen in front of an audience. However where they are outstanding, and for my money the best company working in this method, is the quality of their work, their attention to detail and their storytelling prowess. I often see work in this vein where the story or technique may be interesting but the visuals will look like a GCSE student has been pressured into using acrylics for the first time with no sense of design, thought of colour or composition. Or sometimes you find the opposite, where the aesthetic may be accomplished and striking, but the technique will be clumsy and unconsidered or more often the story will feel like watching paint dry and however pretty the visuals it is not engaging or rewarding for an audience. Over the years, Paper Cinema have got it right and their most recent show Odyssey is a culmination of exploration, expertise and exacting their craft. Nic's drawings are beautiful and even as illustrations alone are evocative, full of weight, life and story. Then their puppetry and movement work developed with Imogen Charleston takes the illustrations into a new realm where depth is created, camera moves are replicated and characters are hidden and revealed. The energy and dynamic movement they create with 2D illustrations is amazing to watch. And watch it we can as the puppeteers sit in front of their screens so we are aware of the process as much as the final piece. Chris Reed's music is complex, sensitive and bold and has all of the ferocity and vitality of a live-gig, so when partnered with the visual storytelling the show becomes completely absorbing, emotive and immersive. As part of the same festival my collaborators on Dream , Handspring Puppet Company, were in Paris with their show Ouroboros. Directed by Handspring’s Associate Director Janni Younge, the piece poetically explores the circle of life, our connections with the land and each other and interactions with death from the perspective of different ages. The puppets are human, delicate and expressive and Janni’s direction for the show takes audiences on a mesmerising journey. Basil Jones and Adrian Kohler who I worked closely with on Dream collaborated with Younge on the puppetry direction and it was lovely to see their touch in the performance. On the banks of the Seine, near Gare D’Austerlitz, a new museum has opened. 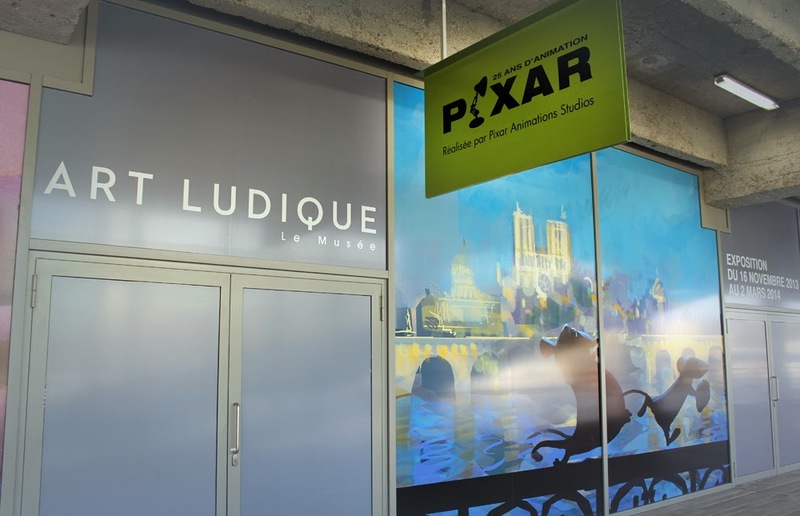 La Musée Art Ludique is a museum dedicated to the entertainment industry; comics, video games, animation and live-action cinema. Their opening exhibition is Pixar: 25 Years of Animation which started life at MoMA, New York back in 2006. Since then it has toured around the world from Japan to Taiwan and all over Europe giving visitors a glimpse into the amazing artistry that goes into creating Pixar’s animated features and shorts. The exhibition features hundreds of pieces of concept art in different techniques including pastels collage and digital paintings as well as character sculpts and behind the scenes films. Having seen various Pixar art already and owning many of their books a lot of the material was familiar yet nonetheless interesting to see up close. By far the most exciting addition for me, worth the price of admission alone, was the Toy Story Zoetrope. For those with less of an obsessive interest in the ancient history of animation, a zoetrope is a contraption originating from the early 1800s whereby sequential images are viewed through slots in a spinning cylinder; the intervals giving the eye the impression of moving image. Zoetropes are traditionally made using still images but the Japanese Studio Ghibli changed this when they created what I believe is the world’s first three dimensional zoetrope Bouncing Totoro. The device uses sequential figures, each with a slightly different poses which together form a looping action. Instead of being viewed through rapidly moving slots, the effect is created by strobing lighting which tricks the eye into seeing 24 separate images per second. Inspired by their Japanese friends, and keen to create a piece for the exhibition which would explain to audiences and young people how animation works, they set about creating their own. The Toy Story Zoetrope is one the most amazing tricks / illusions / joyful things I have seen in a long, long time. The characters from the Toy Story films, appearing in three dimensions at their actual size in the film appear to bounce and run around in front of your eyes. The impression is that they are moving on their own accord and is the closest thing I have ever seen to ‘live’ stop motion animation. The above video from Pixar explains the process and thinking brilliantly, take a look to see the machine in action. My graduation film The Man Who Was Afraid of Falling, made at Newport Film School is now online for everyone to watch. Guilty Party, a new theatre company emerging from the Bristol Old Vic's Made In Bristol scheme asked me to create the trailer for their new show Conviction. The piece is about young convicts escaping from a maximum security prison and finding refuge in an English seaside town. I made the trailer in about three days; one day shooting in Bristol and Weston-Super-Mare and two days of processing footage, editing and sound. The company composed the music and a great guy called Ky Witney made the pumping second tune. I shot the film on my Canon 60D with a 50mm lens and a zoom lens, we did all the tracking shots using Jack's long board - low-fi. Lots of footage shot on a high frame rate and slowed down in post. The bird in the first shot was a lucky accident!